Vibrations. Good vibes. Bad vibes. Too much of vibes. Not enough of them. When I first heard of vibrations, I was in my teens, and it was all about the good vibes coming from great music bands. After that, as an orthopaedic trainee, I was taught that vibrations were bad: helicopter pilots and truck drivers were exposed to exactly the kind of vibrations which induced asynchronous contractions of the back muscles, and had direct deleterious effects on the vertebral discs. The result includes low back pain and osteoarthritis of the lumbar spine. Following this, somebody had the great idea to test vibrations in clinical practice. Lo and behold, some science was injected into vibration science, and it was found that if too much is not too good (actually, it is pretty bad), a measured amount of the right kind of vibration can bring good. Prof. Saggini has been on the forefront of this “good vibes movement”. Prof. Saggini is a thoughtful, skilled clinician, armed with foresight and rigour. He started observing and experimenting, and has been able to produce much of the present day scientific evidence on this fascinating topic. “Mechanical vibration: therapeutic effects and applications” show, as Prof. Saggini would say, that “nothing rests”. Indeed, we are moving all the time, and vibration is at the centre of our life. Progressing from the basic sciences of vibration, the scene is set for clinical applications, in a variety of forms. 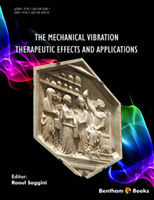 The truth, however, is that: this edition of “Mechanical vibration: therapeutic effects and applications”, provides the beginning, and, through the strict scientific work that Prof. Saggini will continue to perform, more truth will come out of it. Current evidence shows that the entire Universe vibrates; gravitational waves may be regarded as ripples in the curvature of space-time propagating in an oscillatory fashion and travelling outward from the source. Any given complex body is capable of vibrating in several different ways, each one being characterized by its own frequency. The inorganic matter is made up of atoms that are in a constant state of motion; depending on the atomic speed, inorganic matter will exist in a solid, liquid, or gaseous state. By the same token, the human body is made up of atoms in continuous vibration, the latter being necessary for the homeostatic maintenance of the organism. Several essential cellular processes, including cytoskeleton activity, enzymatic reactions, chromosome packaging and replication, nucleic acids transcription and translation, and protein folding and unfolding, generate forces resulting in intracellular movement. For instance, protein polar oscillation during cell division and cytoskeleton assembly greatly contribute to such intracellular dynamics by generating polarizing ionic currents and charge-induced nanoscale movements. The net effect of these events is the vibration of the entire cell and its components. It is currently thought that the transduction of intracellular movements allows the cell to emit vibration waves carrying information about intracellular metabolic status. The latter mirrors the energy internal to the cell, being the proportional to intensity and frequency of the ensuing vibrations. Mechanotransduction analysis assesses the causal relationship between mechanical forces, intracellular signaling, and subsequent changes in cell behavior. Indeed, mechanical forces seem to play a crucial role in several aspects of living tissues, including organization, growth, maturation, and normal functioning. Physical signals are known to travel faster than signaling through chemical mediators, the latter being limited by dependence on diffusion. Accordingly, physical signals appear to represent a more effective way of cell signaling whenever a rapid response is required. The human body is constantly subjected to vibrations deriving from the surrounding environment, including sources such as industrial machinery as well as common means of transport (terrestrial, nautical, and aerial). Overall, such vibrations may be viewed as different forms of the same primitive mechanical oscillation – i.e., endless “variations on the theme” acting at both the macroscopic and the microscopic level. Any vibration or oscillation will induce a tuning response by the cell through changes in signal transduction, resulting in potentially healthy (therapeutic) or adverse effects. Indeed, to quote Paracelsus, «Omnia venenum sunt: nec sine veneno quicquam existit. Dosis sola facit, ut venenum non fit». amelioration of common neurological diseases, including motor impairment. My hope in writing this book is to clarify further the medical role of vibrations in improving human health.